Our thoughts are with Nepal right now as it reels in the aftermath of the 7.8-magnitude quake that rocked through the Kathmandu valley early Saturday morning. With death tolls mounting and tremors felt as far away as Bangladesh and some parts of India, the scale and destruction of this earthquake is tremendous. At the same time, we are constantly in awe of our Kravis Prize recipients as they leap to action in support of relief efforts worldwide. Kravis Prize recipient organizations are often the first on the frontlines and have the ability to mobilize their people quickly and efficiently in response to these disasters. We were reminded of this with Helen Keller International’s presence in West Africa last year during the Ebola breakout, and are humbled once again by the rapid response of BRAC in responding to the current emergency that is unfolding in Nepal. 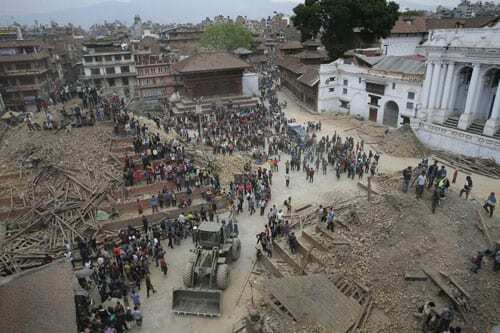 In a message that went out Monday from the BRAC team, they stated that they would be sending a team of their staff to provide 5,000-10,000 blankets, medical treatment, medicine, and food to earthquake victims. “Our core team will provide essential medical support to the victims in collaboration with the Nepalese government,” said Shahinul Hoque Ripon, a doctor from BRAC who will lead the team. Please consider supporting BRAC in their emergency response efforts as they lend a hand to a neighbor in need. Helen Keller International is also working in Nepal and merits your donations.